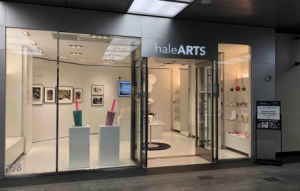 haleARTS GALLERY celebrated an official grand opening at Santa Monica Place on Friday, June 29. The contemporary art incubator known for bringing local emerging artists together with emerging collectors, unveiled “Summer Art Series,” the first exhibition at the new gallery space. haleARTS GALLERY will host an artist reception every Friday evening from 6 – 9 p.m. through August 17. Curated by Chris Davies of Fabrik Projects Gallery, “Summer Art Series” at haleARTS GALLERY is a two-part exhibit featuring 8 contemporary artists, mostly local to Los Angeles. The work intrigues the senses through a variety of media including photography, collage and sculpture. Currently on display through July 22, “Summer Art Series” part 1 features works by Andy Burgess, Betsy Enzensberger, Brandon Kusher, and Marilyn Sanders. Andy Burgess uses matchbook covers and geometric shapes to construct scenes of cities such as New York, Chicago, and San Francisco, transforming them into glittering mosaics of color that challenge the viewer’s perception of spatial depth. Betsy Enzensberger is known for creating larger-than-life resin sculptures of dripping, frozen treats and other sweet delights. Brandon Kusher’s photographic work conveys an understanding of each individual’s identity and communicates rare human moments of spontaneity, intimacy, and authenticity. Marilyn Sanders‘ Botanicals series showcases a selection of black and white and sepia-toned photographs, representing a culmination of decades of aesthetic and conceptual exploration. “Summer Art Series” part 2 will feature new creations by artists Jessie Chaney, Maureen Haldeman, Sarah Hadley and Weldon Brewster and will be on display July 27 – August 19. In his architectural collages, Jessie Chaney’s photography draws on traditions of fine art, photojournalism, social documentary and anthropology. Maureen Haldeman‘s work focuses on the urban landscape and natural environment, primarily the ocean and coastline of Los Angeles. Sarah Hadley‘s Lost Venice series explores the seemingly endless maze of the Italian passageways and canals. Los Angeles based photographer Weldon Brewster has created distinct images that capture the essence of a particular time and place. haleARTS Gallery is open for limited hours on Friday and Saturday from 10 a.m. – 9 p.m. and Sunday 11 a.m. – 8 p.m. Other times are available by appointment (email info@halearts.com to schedule a private appointment). Artist receptions are every Friday from 6 – 9 p.m. through August 17. For more information visit www.halearts.com. August 17- Artist: Maureen Haldeman.